David Bonderman, left, and Robert Krebs, right, plan to leave GM board this year. DETROIT (Reuters) -- General Motors said two of its outside directors will leave the company's board later this year. 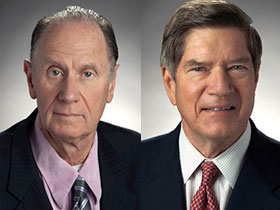 David Bonderman, 71, told the company on Jan. 29 that he would not stand for re-election at the annual meeting in June, while Robert Krebs, 72, will retire immediately, prior to the meeting, in accordance with company policy regarding retirement age. The company didn't provide a reason for Bonderman's exit. Both have been board members since July 2009, following GM's exit from bankruptcy. The company reorganized with the help of a $49.5-billion U.S. taxpayer bailout, and last month, Mary Barra took over as chief executive. "I'm proud to have been part of the company's resurgence," Bonderman said in a statement by GM. "I'm sure that Mary Barra and her team will keep GM moving forward." GM spokesman Dave Roman did not say whether both men would be replaced on the board, which has 14 members including Barra. Including Bonderman and Krebs, there are 12 outside directors on GM's board. The board includes former Vice Chairman Steve Girsky, who remains a senior advisor until April. Bonderman is co-founding partner and managing general partner of private equity firm TPG Capital. Krebs retired as chairman of Burlington Northern Santa Fe Corp. in 2002 and had previously served as chairman and CEO of the railroad company from 1999 to 2000.